Climate Change Connection > Science > What might happen in the future? How hot might it get? What is expected to happen to precipitation patterns? How do they make these projections? We know that the world is warming, and we know that it is expected to continue to warm in the future. Over the course of the twentieth century, the global average temperature increased by approximately 0.74°C. (1) It is expected that the twenty-first century will yield a similar outcome: an even warmer planet. This warming will not be distributed equally around the globe; certain parts of the world are expected to warm more than others. Projections show that areas located at higher northern latitudes (such as Canada and the Arctic) are expected to warm more than the projected global average. How climate change will impact precipitation is cause for concern in all regions of the world. Precipitation impacts our food production, our drinking water availability, our economy, our recreation and our property. Changes in precipitation amounts and distribution will impact most aspects of our lives. Projecting future precipitation patterns is much more difficult than projecting future temperature trends. Climate models are limited in their ability to provide precipitation projections. In general, regions that are wet now are expected to get wetter. Regions that are dry will get drier. Manitoba lies between regions with opposing precipitation shifts. The Arctic and Alaska are expected to get wetter. The American south-west and Mexican Baja are expected to get drier. 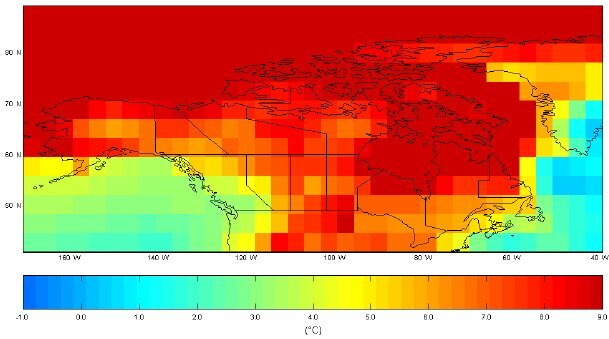 Applying various scenarios to computer climate models provides us with the means to make projections about how the climate could look in the future. Climate Models Global Climate Models (GCMs – also known as general circulation models) are the tools that scientists employ to predict what the future climate will look like. GCMs are complex computer programs that make projections by relating multiple variables, processes and their interactions in order to simulate what the resulting climate outcome could be. There is a large array of processes and variables that affect our climate system. Modern climate models account for a large number of these key elements and do a good job in providing us with a snapshot of the future climate. Greenhouse gas concentrations in the atmosphere are an important driver of global warming, and humans are contributing to the greenhouse gas problem to a large degree. Because anthropogenic sources of greenhouse gas emissions are the result of human activity, and human activity in the future is not very predictable, different emissions scenarios are used to account for the various levels human influence on greenhouse gas concentrations. The Intergovernmental Panel on Climate Change (IPCC) developed a system of scenarios that estimate how greenhouse gas concentrations in the atmosphere could change in the future in response to human activities. The scenarios take into account the direct contribution of greenhouse gases from the burning of fossil fuels, but also consider other natural and human-induced factors that influence greenhouse gas concentrations, such as technological advancements and population growth. Climate change is a complex interaction of multiple factors and processes. As climate change research progresses, so will our understanding of the processes at work. Because human activities effect the climate in profound ways, it is important to consider how humans will impact the climate in the future when discussing climate change. Population growth impacts our climate as it produces more consumers, and thus more people to use resources. as does the technology available to drive our economies. Our level of commitment to sustainable development impacts our climate. How we will decide to live our lives in the future will impact our future climate. Knowing what choices we will make as societies in the future is not clear. There are many paths that we could choose to take. The IPCC accounts for the human element uncertainty by adopting a system of scenarios. These scenarios allow climate models to make projections for the future while considering the many different choices that we, as drivers of climate change, may make. Climate models do not model as well for clouds and precipitation as they do for temperature. Making projections about how precipitation amounts and distribution will change in the future is thus difficult to do with a great degree of certainty. First generation climate models were simple in nature, and did not account for many factors beyond atmospheric processes. Today, climate models are much more complex: they account for a variety of processes, feedbacks and variables. As climate models continue to evolve, their ability to predict precipitation amounts and distribution will most likely improve as well.